Jan 27, 2019 | What Am I Reading? 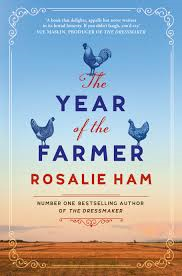 In Rosalie Ham’s new, darkly comic novel The Year of the Farmer (Picador 2018), we are returned to the microcosm of rural life in country Australia. As with The Dressmaker, Ham peers through a microscope at life in a small, isolated town and the myriad of eccentric characters and divisive issues that it contains. The book is chock-full of fascinating characters and the plot is absorbing. As in The Dressmaker, at the centre of the story is a woman absent some years who returns to her hometown with mischief on her mind. In The Year of the Farmer, it is Neralie Mackintosh who left five years ago to find herself in Sydney, but decides to return to her farming community to run the local (and only) pub. Everything went downhill when Neralie left: drought seized the land and parched it dry; bands of bloodthirsty dogs roam the landscape; the local water authority is up to its eyeballs in corruption and underhand machinations; and most importantly, Neralie’s ex-boyfriend, the lovable but easily misled Mitchell Bishop (our hero, and the farmer of the title) has fallen into the clutches of the sly, dislikeable, gold-digging Mandy, who schemed her way into persuading Mitch to marry her and who now looks down her nose at everyone else in town as if she runs the place. Poor Mitch lives a loveless marriage on his family farm with Mandy and his aging father, Callum, whom Mandy mistreats. But when Neralie returns to town, war is declared between the two women, with everyone taking sides. Each of the characters in this novel – even the minor ones – are three-dimensional, well-developed portraits. There is Glenys ‘Gravedigger’ Dingle, hoping to make money from her water schemes. The hapless Paul who runs the post office. Old Esther who knows more than people think. Jasey and Lana and Kevin and Debbie. The river divides the riparians from the hippie ferals from the Single Mothers from the Rural Women’s Club from the townies from the Water Authority folks. Not to mention Nurse Leonie Bergen, who views each of the locals with a cynical memory about which ones she wishes she’d rather not helped into this world so many years ago… All of them in the grip of a terrible drought, the farmers losing stock and ploughing over their unsaleable crops; everyone trying to make ends meet and still make their loan repayments; all of them battling the elements and mother nature. I did find it a little difficult to follow all the intricate details of the Water Authority – the buybacks, the allocations, the TCC (Total Channel Controls), the Dethridge wheels and the solar-panelled gates – but I suspect this is due to my lack of knowledge about the impact of drought on farming communities and the importance of water as a tradeable commodity. And there are certainly a LOT of characters to keep track of, and some of them I felt I would’ve liked to know better. But this is more than accommodated by Rosalie Ham’s keen observation of the dynamics of a small community and her satirical and often hilarious astute observance of the individuals within it. And her descriptions of the Australian landscape are spot-on: the wide-open, empty sky; the flat, arid environment; the flora and fauna. Even the domestic animals – including Mitch’s faithful dog Tink and his ageing donkeys Mark and Cleopatra – emerge with distinct personalities and endearing qualities. The characterisations in The Year of the Farmer are superb and memorable, and the plot is well-paced and intriguing.